Hey everyone! Hope all of your are having a lovely weekend! 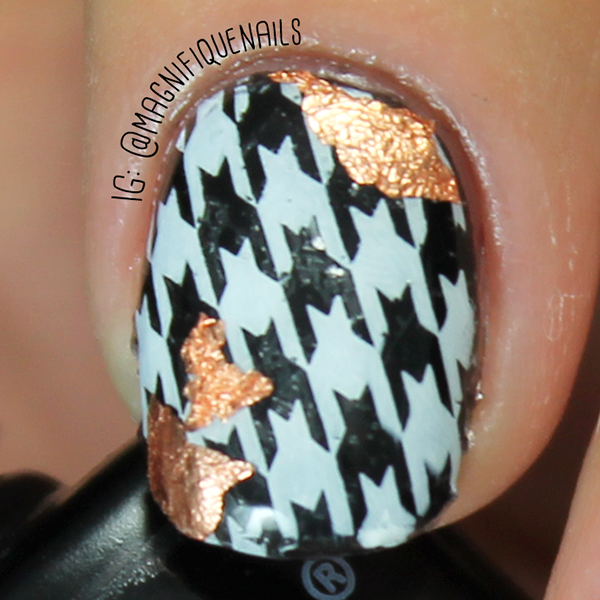 For today's post I have a super cute and fun nail art design, using Pretty Woman Foil Effect Kit. 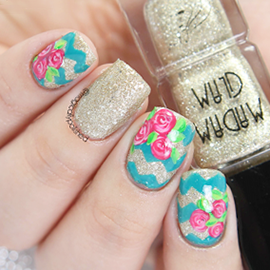 I mean who doesn't love foil nail art. 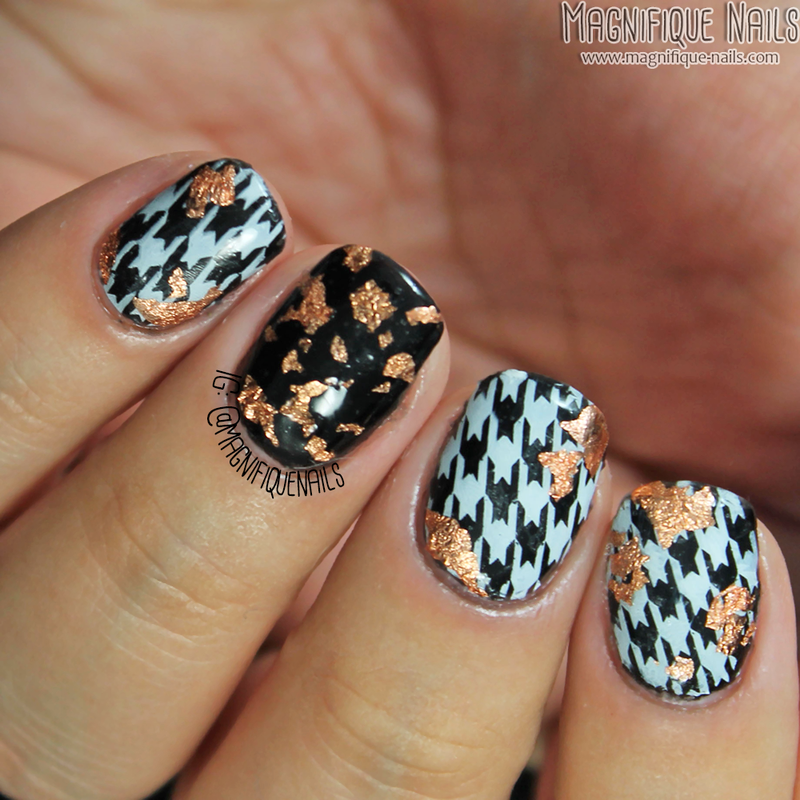 They are super fun to use, and they give the nails a fun and classy look, especially on a black base. So when I received these Foil Effects Kit from Pretty Woman, I was super excited with ideas. I mean really excited, I think my brain was on overload. However, it automatically shut down, when I remembered a specific houndstooth design I saw on Instagram from @atxlacquerista. Perfect for back to school! Let me know on the comments below if you want to see a tutorial?! In the kit includes Gelogic Black Berry, and various of colored foils from silver, bronze, gold and a multicolored gold, in individual jars. The application of the polish and foils were fairly easy to use and to apply. The formula on the polish was slightly thin, and needed two coats for full coverage. Overall was very quick to dry and had a glossy finish. For a simple design on a black base using two coats of Gelogic Black Berry. When you do apply the foils you can use a clear nail polish or top coat, wait for a few seconds (20 at least), then break a few pieces and press the foil on to the nails. You can place them wherever you like. I used the golden foil, and sealed it with top coat. 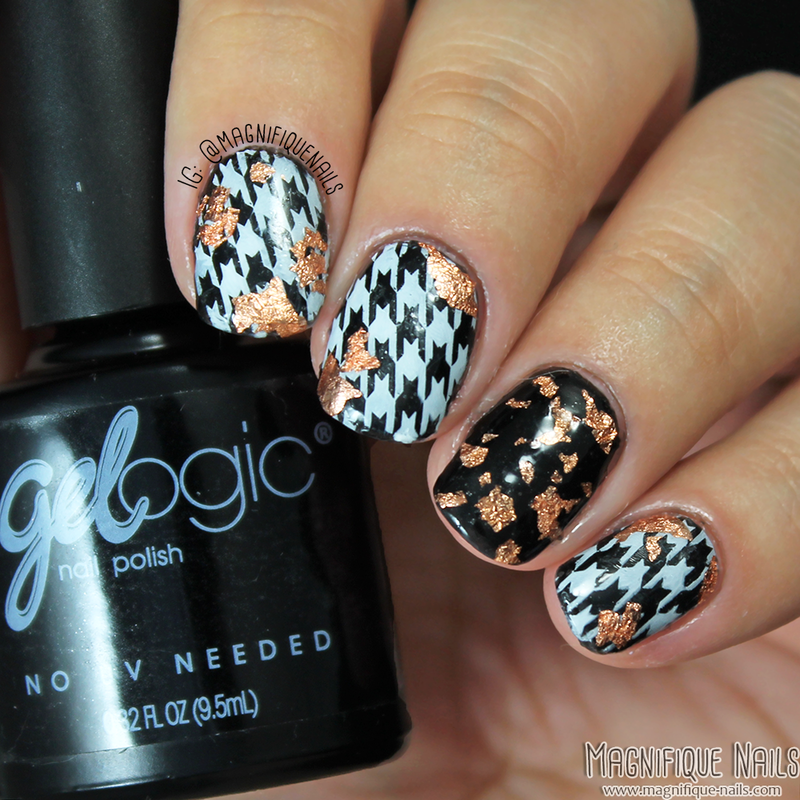 Now for this design, I've decided to use my stamping plate (I was a bit lazy to do a freehand houndstooth haha). For the base I applied two coats of Gelogic Black Berry. 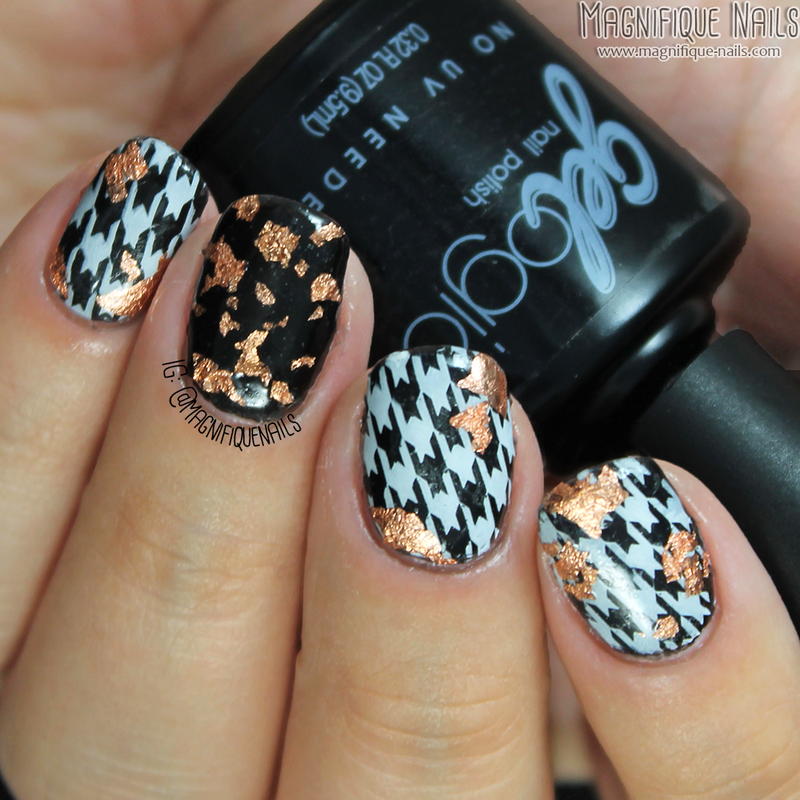 Once the polish was completely dry, I then stamped the houndstooth design on the nails, using OPI Alpine Snow. I then applied a thin coat of top coat. While still slightly lackey I used the bronze foil, and pressed the foils where I wanted them to go. Lastly, I sealed the design with H K Girl Top Coat. Overall I really loved how these came out! 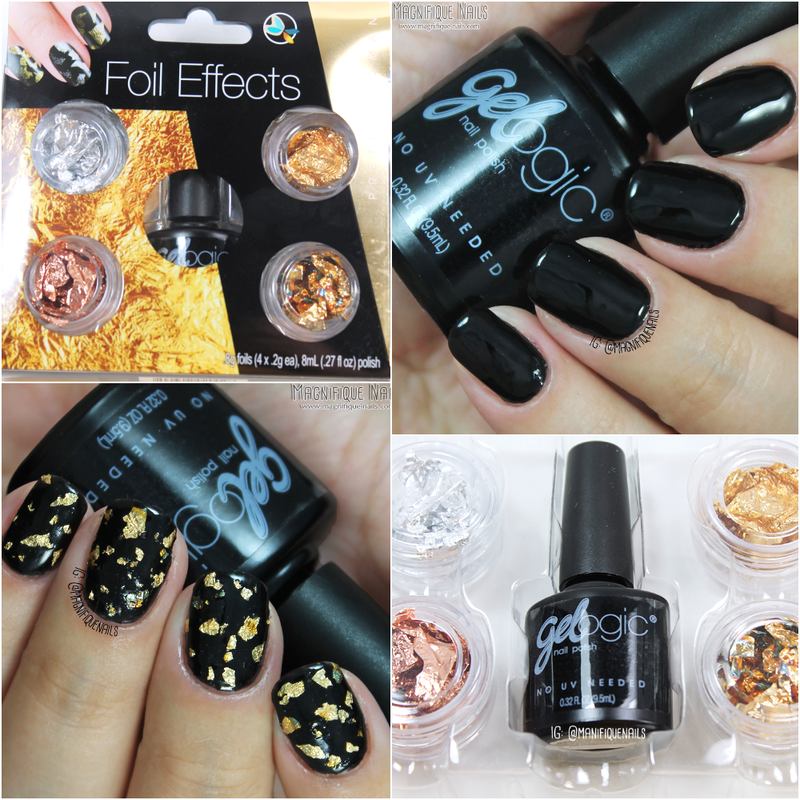 It looks super fun to wear for any occasion.You can purchase Foil Effects Kit in Rite Aid stores or from their website for $7.99.